Zahi Hawass has posted on his blog a report on the looting of the museum (see below). It is a self-damning account: Hawass admits that the museum was not well guarded, "unfortunately", but his account strongly implies that the museum was hardly guarded at all. Only three tourist officers were in the museum, and they were there only because they were not able to get out before the curfew. The museum thus was massively vulnerable, and was saved from a far worse fate only because the mob of 1,000 that scaled the wall pillaged the newly built gift shop in the mistaken belief, Hawass tells us, that they were in the museum itself. So, to sum up, in the wake of a revolution in Tunisia that made it very likely there would be unrest in Egypt, the national museum had no contingency plan in place. Nor have other museums or the archaeological sites been secured: Hawass tells us that "I could not find anyone to protect the antiquities at the site" of Abusir, for instance, and looters armed with guns and a truck have emptied a storehouse of the Port Said Museum, while, unmentioned by Hawass, the Memphis Museum has been reported looted. That security was so lax is astonishing, especially after the object lesson one would have thought the looting of Iraq's Museum and archaeological sites taught us all. Hawass should be held responsible for this failure, along with whatever museum security experts the museum and the antiquities council have been using. Beyond that, the international community of heritage protection organizations needs to stop pretending that security against looting is something they can leave to others so they can focus on the nicer tasks of conservation, excavation, and tourism-related development. The need to make securing and policing sites and museums job one should have been learned from Iraq. Maybe it will be now. The Egyptian Ministry of Culture has been reviewing its museums' security protocols since the theft of a Van Gogh from the Mahmoud Khalil Museum. Clearly, no one expected the Cairo environs to grow so hostile so fast. Even with a lock down, which it appears the Museum instituted, there was little it could do without the support of the army, which was clearly focusing its attention elsewhere. What alternative steps could have been taken to prevent this from happening since only six days ago the protests were much less volatile? It reads as if it were a rhetorical question, but it is not true that there was little the museum could do without the support of the army. It is in the nature of political protests that they erupt quickly, so museums need to have contingency plans ready to dal with this eventuality, which calls for security protocols that have to be different from those designed to prevent clandestine theft. a) the tourism police, who apparently were the forces available to Hawass, should have been deployed in greater numbers. Of course, if the number of looters attacking the museum is in the hundreds or thousands, antiquities police cannot be expected to hold the fort, but in this case the number of looters was small and could have been fended off if all the entrypoints had been covered, it seems. b) citizens should have been organized in advance into a "Protectors of the Museum" or some such civil-society disaster-assistance group like the Blue Shields. My information may be wrong, but what I have heard is that Egypt has no Blue Shield, and nothing like SAFE. Given Hawass' celebrity it would have been a snap to organize such a group, which would have arrived earlier and had a stronger plan for stopping looters than the deeply moving ad hoc human chain did. c) the museum should have had a standing arrangement with the Egyptian army to have forces deploy immediately upon request. Bad, but it could have been much, much worse. Photos here and here and here (thanks to Chuck Jones). What is disconcerting is that it could have happened at all, given the fate of the Iraq Museum. One would have expected that Zahi Hawass would have anticipated some such eventuality and that the museum would have had the wherewithal to lock itself down. That does not appear to have been the case. This should be a wake up call. Right now, the national and international agencies and NGOs who make it their business to save our vanishing heritage -- the Smithsonian, the State Department's Bureau of Economic and Cultural Affairs, UNESCO's World Heritage Centre, INTERPOL, ICCROM, ICOM, AAMD, AAM, AIA, Blue Shield, World Monument Fund, Global Heritage Fund, World Heritage Foundation, the Getty, etc. etc. -- should be on the phone to museum officials in all countries where there is the chance of unrest, asking them if they have in place a plan to secure their buildings and holdings, and offering immediate assistance to create and/or beef up these plans. This poll should come as bad news to the hard-core libertarians in the antiquities-collecting community, but good news to those of us who believe that archaeological sites are a public good. Even in a strongly Republican state, most Americans recognize that those who loot our sites are destroying something valued by us all, that an unpoliced market in antiquities abets this destruction, and that policing means making it clear through prosecution and convictions of looters and dealers in hot pots that their activities are not to be tolerated. The publicity around this case has undoubtedly sent a signal, and it will be interesting to see whether looting of Native American sites in Utah is reduced substantially or not. On one hand, those who might otherwise have been contemplating heading off into the national park to chisel off a petroglyph may think twice, and public awareness of the importance of preserving archaeological sites is higher now; on the other hand, the publicity in itself has probably also raised awareness about the money that a good pot can bring, so that there are probably a lot more folks to whom the idea of looting will occur. And if, like Arizona and other states in dire fiscal straits, Utah cuts back on the policing of its parks, the good done by these prosecutions may be obviated. Micah Garen and Marie-Helene Carleton have posted the trailer for the long-awaited "Road to Nasiriyah", a documentary about the looting of Iraq's archaeological sites. It is based on footage shot in 2004 before Garen and his interpreter were kidnapped and held for ten days, a twist that inevitably shifts the dramatic focus of the film to some extent from the looting to the gripping personal story, a turn that is augmented by the film's attention to the equally gripping personal story of AbdulAmir Hamdani's struggle against the Iraqi mafia who control the looters ravaging Iraq's heritage. No other journalist had the temerity to do what Garen and Carleton did, and the footage they are finally releasing therefore offers a unique glimpse of the actualities of looting. 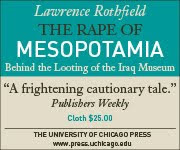 It is not clear from the trailer whether the final cut will pull back from the on-the-ground view, invaluable as it is, to also include interviews with those whose policy choices left Iraq's sites vulnerable and Hamdani and others hamstrung, or with those collectors whose deep pockets and willingness to buy dodgy artifacts fuels the looting. Nonetheless, this film will be a must-see for anyone interested in understanding how and why many of Iraq's sites were destroyed. And it should put the quietus to those who have pooh-poohed reports of massive looting. UNESCO is considering updated the 1970 Convention to include requirements for states to set up specialized antiquities crime teams, but unless international law is also amended to make it possible for these national teams to coordinate efforts, crimes will go unreported by one country to another, and efforts to stop crime in one country will simply shift it elsewhere. Ferri doesn't suggest many solutions, though he does say Italy would be better served if it adopted something like Iraq's legislation which makes it a serious crime to not turn over to police objects excavated after 1995. While such legislation didn't do much to stem the looting of Iraq's sites, because there have been no antiquities police deployed to enforce it, similar laws under Saddam worked well (at least until the sanctions and no-fly zones eroded enforcement capabilities. Italian carabinieri armed with such a law would certainly be able to do even more than they are doing now, which is already considerable. The countries of origin would own anything that was excavated there and keep most of the finds on display in local partnering museums. But the museum that sponsored the dig would be allowed to borrow a percentage of the finds and exhibit them in America. Eventually, all the finds from a site would be exchanged on a rotating basis between the country of origin and the museum, which would pay the expenses and insurance. The basic framework seems entirely reasonable, if only countries of origin could get over the very high political hump of persuading their own citizens that patrimony is not being lost but only lent. Academically-affiliated archaeologists have found it impossible to make this sort of arrangement (so far as I am aware), but they came to the table with far less money in their pockets than museums are likely to be able to muster, so perhaps a deal could be arranged that would allow the antiquities ministries to dicker. Even individual collectors could invest and participate in the exchanges, if they were trained to care for the finds on temporary loan to them. Someday, investors or their heirs could sell these shares at auctions and galleries, just like works of art. This is a bad idea, for several reasons. First, the idea of antiquities being turned over, even if only for a time, to wealthy foreign individuals would be far more toxic politically than loaning pieces to museums -- especially if, as is almost sure to be the case, these same individuals are notorious for collecting illicitly excavated antiquities. (And it would not just be citizens in countries of origin who would be appalled -- Americans might be as well. We do not see the Met raising money by loaning out pieces from its permanent collection, for good reason.) Second, this sort of quid pro quo would probably mean that collectors who might have supported the museum's excavations as a matter of public-spiritedness will stop donating. Why donate when one can invest? Moreover, how would museums vouch for the training of individual collectors or for the safeguarding of materials in private hands, especially if the loan rights are to be then sold or auctioned off to other individuals? Can you imagine the insurance that would be required to cover, say, a one-year loan to a private collector, or the furor that would ensue if the piece were somehow damaged or stolen while out on the mantelpiece in a Park Avenue penthouse? Neither of these practical objections is insuperable -- museums might require collectors not just to be trained but to employ museum curators, for example, and collectors might be found rich enough or able to put up comparable artifacts as collateral to cover the insurance costs -- but the problems are real. There is also a concern about whether excavations driven by museums will be conducted with an eye to finding the most spectacular artifacts rather than the more humble but likely more archaeologically-significant materials. Curators working for collecting institutions are certain to be judged on whether they bring back the trophy, not whether they broaden our knowledge of ancient trade routes or enable us to tell when the ancients first began to conceive of the soul as surviving the death of the body. Last but not least, there is nothing wrong with museums getting back into sponsoring excavations, but the idea that this would "put looters and smugglers out of business" is simply ludicrous. Yes, demand at the top end would be reduced, and yes, this would make smuggling less lucrative, but we are talking about a worldwide demand, and many high-end collectors, especially in other countries, are not going to participate in these arrangements. Even libertarians recognize that markets cannot completely regulate themselves, that property must be secured, and that police are necessary to do this. Until those who love the individual artifact come up with a policy that helps pay for antiquities police as well as reducing demand, we should remain skeptical.